Call for Participation: KUKA Innovation Award 2018 – Real-world Interaction Challenge – Sponsored by KUKA AG. Medical robotics applications are particularly welcomed! "As a world-leader in robot-based automation, KUKA has maintained an intense collaboration with academia and R&D partners worldwide on various scientific and technical topics for many years. 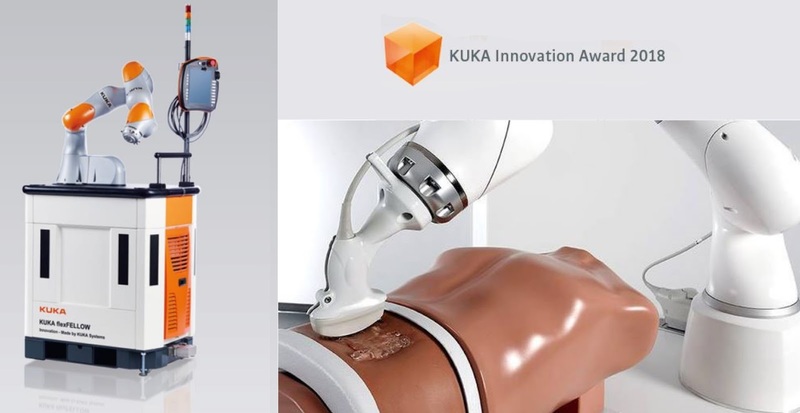 To take this collaboration to the next level the KUKA Innovation Award has been established in 2014 under the patronage of Dr. Bernd Liepert, Chief Innovation Officer of KUKA AG. It comes with a substantial financial prize of 20,000 €. The competition leading to the Award is intended to accelerate the pace of innovation in the field of robot-based automation at large and improve technology transfers from research to industry. KUKA offers the finalist teams a free-of-charge LBR iiwa mounted on a flexFellow carrier as well as an optional stereo vision sensor for the duration of the competition. KUKA is partnering with Roboception for providing the vision sensor. The sensor is not yet available as a product so that participants gain early access to an innovative technology. Applicants for the Award have to demonstrate an innovative robotic application targeting the Realworld Interaction Challenge as described below. Demonstrations should make use of the provided mechatronic systems and enhance them where necessary. The focus is on a versatile system design which contains innovative software and hardware components applicable beyond one specific use case, in this year especially beyond industrial application.Proposals for the award must be submitted by July 2, 2017. They need to address the motivation for the solution to be developed, details regarding its realization and an already established proof of concept in a working system. The proposals will be reviewed and the top-ranked teams will be invited to present their proposals to an international jury from research and industry in an online session for the selection of 5 finalist teams. Following this selection, each finalist team will sign an agreement to implement its ideas on the provided hardware. Teams will receive an initial training on the hardware and will be continuously supported and coached by KUKA to be more effective in the implementation phase. Finally, the teams present the developed solutions to the expert public, the jury and both KUKA top management and senior developers at a major international trade fair in April or June 2018 in Germany, where the winner will be selected and the Award ceremony will be held. All intellectual property generated in the competition belongs to the participants. The participants are encouraged to use the KUKA-sponsored exhibition at the fair to engage also with third parties to initiate technology transfers and new cooperation projects." Read more in the call.